Before I show pictures of me in my unmentionables, I thought I'd share my latest version of B5219, which is like the HP Sunshine top that I'm too cheap to buy. Since I last made this up as purple pajamas, I added a FBA. This gave me more gathers at the bust, but it also added some length to go over the bust, and apparently I didn't need the length. If I move for a few minutes in the top, I wind up with a horrible swag between my breasts. I've already taken an inch from the pattern in that area so hopefully my next version won't have that problem. Please tell me it isn't too distracting and I can actually wear this top out of the house. Right now, I'm thinking I need to undo the yoke and remove the extra length so that the swag goes away. I didn't have enough of the olive green poly knit to cut both the yoke and the yoke facing so I went hunting in my stash. Normally, I'd throw anything less than a yard away. However, I really liked this buttermilk knit from EOS, so I kept the leftovers from a top I made about five years ago. I'm so glad I did. It matches really well and gives the top a bit of distinction. Not plain at all. Another alteration I did to this top was to make the neckline less wide. The pajamas muslin felt too big because of the width. I brought in the neckline 3/4" tapering to 1/4" at the center front and now it fits perfectly. You can't tell, but you've already seen my newest bra. I'm wearing it in these pictures of my new top. On Pattern Review, there is a plus-sized bra sew-along going on. There are only about 4-5 of us sewing along, however. Feel free to jump on over and join us. 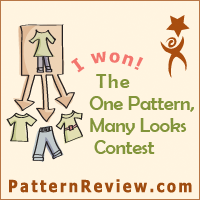 There is a lot of discussion about sizing and different pattern options. I really like a partial band bra and was going to try to draft one from a full band pattern until Debbie Cook offered to send me her Elan pattern. It didn't work out so well for her. Thanks Debbie! Hop on over to her blog and see the beautiful bra she just made from a new pattern. My pattern didn't work out as well for me the first go-around. However, I haven't given up. I will be making me some beautiful bras before I'm done too. Meanwhile here are the ugly muslins I just finished this weekend. The first muslin I made was a 42C, my RTW size, which fit in the cup but was really quite skimpy in the coverage at the top and sides. Also, the bottom of the center piece was too narrow for the wide spread between my breasts and the band was too tight. For the next bra, which I finished completely, I traced the D cup but then cut the diagonal cup seam back at the C sized pattern and raised the upper cup 1/2". This successfully gave me more coverage. However, I think it still needs more coverage at the underarm. It's also too tight at the bottom of the band, but not at the top of the band. I need to do something more to make the center piece lay flat against my chest. So tonight I'm going to make pattern alterations for muslin #3 and see how it goes. I may have to curl up with The Bra-Maker's Manual to figure some things out. The bad part of sewing a bra is that you almost have to completely make it before you can try it on. It does help if you can baste with your sewing machine so you can cannibalize parts from it for the next muslin. OK, now that I've got that out of my system, I can share with you what I just sewed up for spring. Sorry about the blur. I haven't figured out why my camera does that when I use the timer. In a recent article in Australian Stitches Magazine they discussed this treatment for stretch lace. I took a very pretty lace and channel stitched it onto some cotton lycra. Both are from my stash. It was very boring so I only did the front bodice. The pattern is my TNT t-shirt pattern and the sleeves are from the Ottobre puff-sleeved top. They didn't puff because the armhole is larger in this top. I'm not loving the sleeves, but maybe they don't look that bad? I'm hoping that after I wash out all the temporary spray adhesive that the cut channels will flutter a bit. Because of the diagonal pattern on the lace, I decided to make my channel stitching on the diagonal too. DH said he liked it. Here's a close-up. It's different and interesting. I might try it again with a vertical channel next time. Anyway, it was a fun technique to try and didn't take much time. I sewed the channels one night and cut out the top and stitched it up the next. I've neglected to post the fabric I got at Metro Textiles when I was there visiting with Karen, Carolyn, Elizabeth, and Terri. All the fabrics are either rayon or cotton knits. Really the are just some very good staples to have on hand. I have a difficult time finding cotton knits that doesn't cost over $12/yard. The animal print is a stretch lace. I'm thinking about using it for something soon.